We continue today with our tour of Monticello. Part one found here was posted last week. Our group of 25 was ushered into the entry hall. 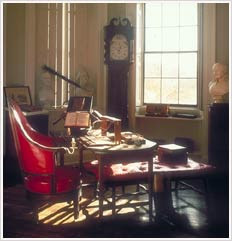 This picture (all interior pictures) was taken from the Monticello website http.monticello.org, which is a wonderful resource of information regarding the house, grounds and background of Thomas Jefferson. 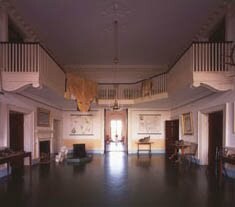 All guests were greeted here and Jefferson used this space as a exhibit hall of sorts for natural history specimens, busts and paintings. 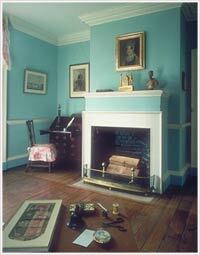 The next room was the South Square Room, which served as a sitting room for Martha Jefferson, Thomas' daughter, and her family. She also taught her children and managed the plantation for her father from this room. The library or bookroom was next and was a very small room for our group of 25 to assemble to continue to listen to the tour guide. Remember she warned us before we entered the home that no one was to touch anything in the home, including the door knobs. As we entered and exited rooms, the doors were shut behind us and the guide stood in front of the door as she described in detail the items in each room. It was sometime in the few minutes of the speech that Mr. B tapped me on the shoulder and pointed out that I was leaning against the wall of the room. I was very, very warm at this point and getting jello legs. We progressed to the next room, where you could view the Cabinet from the door way. 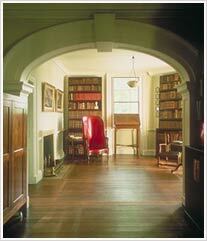 Here Jefferson wrote, read and performed scientific observations. This room connected into his bedroom. In his bedroom the bed is situated to divide the Cabinet from the bedroom in half. While the guide was educating us on the obelisk clock at the foot of the bed it happened. The roller coaster feeling of all my blood rushing to my feet. I just knew I was going to pass out onto some irreplaceable piece of American History. I whispered to Mr. B "I have to leave", to which he said "We're in the middle of a tour and anyway you can't touch the door knob" - that sounds about right doesn't ladies?? I interrupted the guide and explained I was ill and had to leave immediately. Well, you would have thought I'd announced a bomb planting, because staff came out from the woodwork (according to Mr. B) and ushered me back into the "offices" of the home. They were so kind to offer me water, a wheel chair, a sick bag, etc. After a few minutes of resting and cooling off I was much better. We took the shuttle back down the mountain to the visitor's center. I had managed to get these pictures of the center and gift shop where they sell many wonderful plants and gifts. We thought about purchasing a perennial to plant at home, but decided it would not survive the 5 days left on the road. Here are some additional shots of the plant material offered for sale. Here we are inside the gift shop. This is a dark picture, but I wanted to give you an idea of the size of the gift shop. It is quite large and on this day was really busy. They offered a lot of botanical. Here's a wreath for sale. And some Mary Lake Thompson towels! Other than passing out in Jefferson's bedroom, it was a wonderful tour. I hope you enjoyed the visit. I am joining Outdoor Wednesday at A Southern Day Dream. and thanks for the tour of Monticello. I got to see this amazing place two years ago, only it was freezing cold. I'm glad you got over feeling sick. Some of those tour guides are kinda long winded and having to stand for that long sometimes gets me, too. thanks for the wonderful tour of a very beautiful classic and unique home. You just got a case of 'the vapors' dear, very common back in the day!! LOL Sorry you missed the rest of the tour, unfortunate timing. Glad it passed quickly. Great tour! Just beautiful place! !